RESPEC, a water-resources consulting and services firm, is currently under contract to operate and maintain an early-warning alarm system over a brine cavern beneath the former I&W facility in Carlsbad, New Mexico. The brine cavern was formed as a result of solution mining of the Salado, a salt formation located 450 feet below ground surface. Brine is commonly used when drilling through salt to prevent dissolution around and above the drill bit, and is mined by injecting fresh water into a salt layer, allowing dissolution to take place, then pumping the brine out. This process formed an underground cavern, which regulators concluded may be similar to two other caverns that collapsed in New Mexico in 2008. The Carlsbad brine cavern is believed to be in imminent threat of collapse, which could directly affect adjacent residential areas, two major US highways, a farm and ranch store, a church, and the Carlsbad Irrigation District canal that supports large farming communities to the south. A collapse also has the potential to force brine water into the overlying aquifer, where it could contaminate local groundwater with salt. Since April 2009, RESPEC has been tasked with providing surface subsidence monitoring and an early-warning system. RESPEC initially installed four Lily borehole tiltmeters, pressure sensors (on the wellhead that connects to the cavern), and vibrating-wire piezometers in nearby monitoring wells. 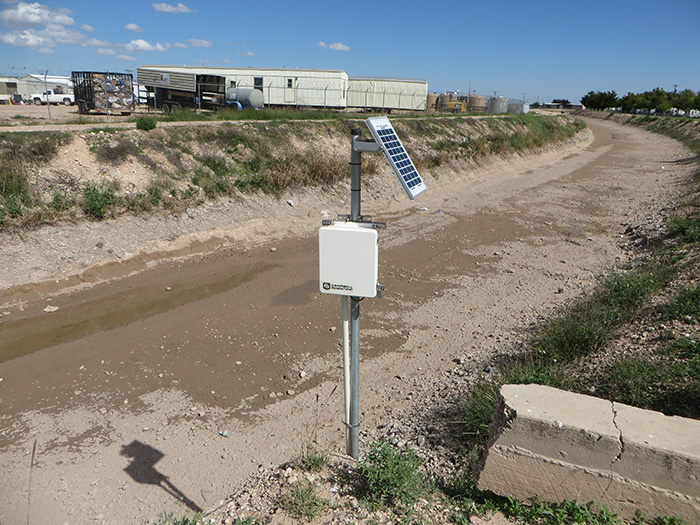 More recently, RESPEC installed a water-level piezometer in the irrigation canal (which uses solar power and RF401 radio communication), a precipitation gage, two 109SS ground-temperature sensors, a 107 air-temperature sensor, and a barometer. The system is operated on a continuous basis using Campbell Scientific dataloggers powered by the local grid and backed up with a UPS. Data is streaming real time to an off-site, web-accessible server. Alarm thresholds are set on tilt, wellhead pressure, and water level in the shallow aquifer. Alarms are also set on the data stream and will be triggered if excessive time lapses before data is uploaded. Alarms go out by text message and email and are configured in a multilevel fashion. Low-level amber alarms go out only to project engineers, while higher-level red alarms immediately notify local emergency-response crews and project engineers if data values exceed set thresholds.